Mobile marketing is expanding exponentially. All the enterprises organization, startups, governmental organizations, and all sectors started deploying mobile apps to increase the customer base and to retain business. It is crucial to validate functional and non-functional aspects of mobile apps. Every day new mobile is getting released in the market. Every week apps are getting updated in the apps stores. It is getting tough to test the business scenarios in each and every device. 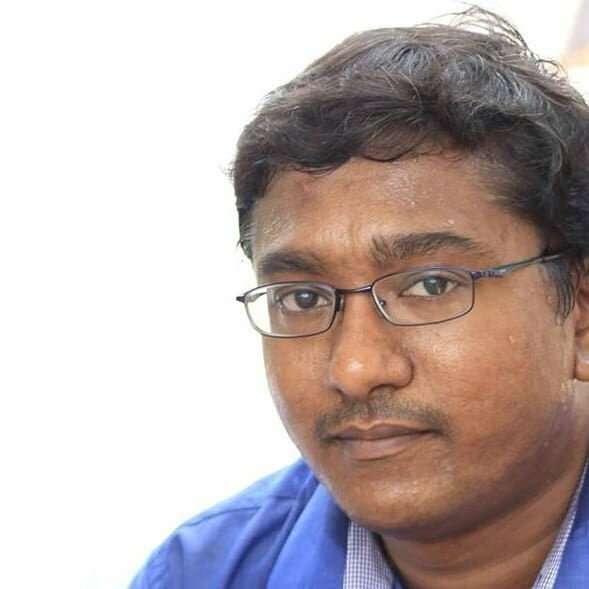 This article tells how to perform performance, security and functionality on real devices using Monkop. How to use Monkop service? 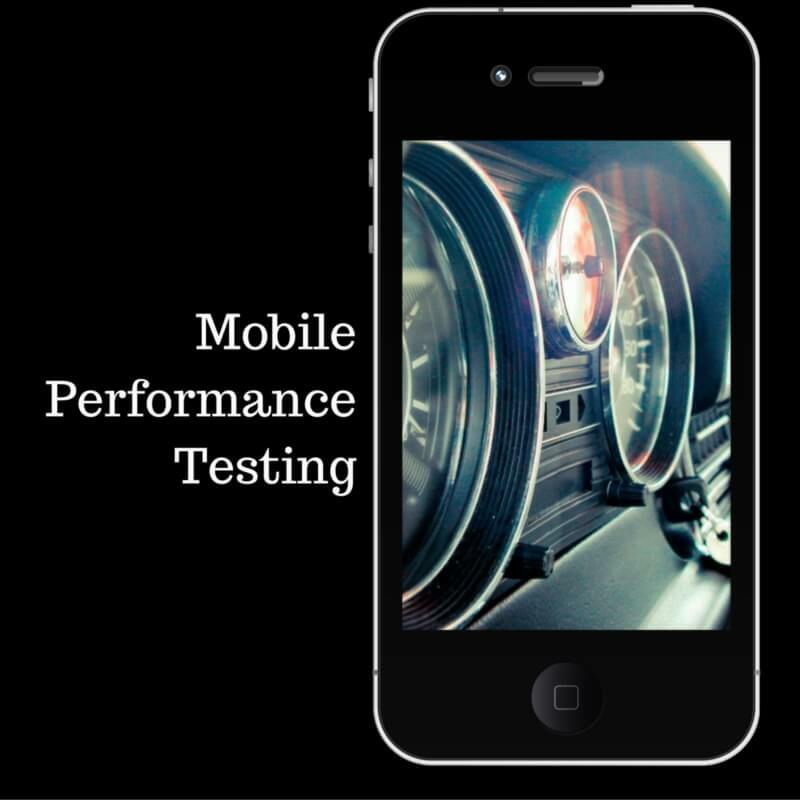 Monkop offers testing as a service for mobile devices. Its offerings are mobile performance, security, functionality, and performance and security tuning. Here is the catch: Monkop claims that the testing will happen using real devices. It is very simple to use Monkop service. Go to www.monkop.com and drag-drop your apk file. That’s it. Enter your email id and click on SEND ME THE REPORT button. 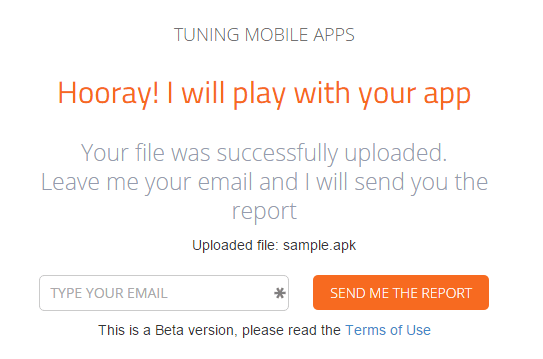 Monkop will test your app and share the detailed report. Basically Monkop installs the apk randomly (free plan) on different devices such as mobiles and tablets where it covers range of OS, screen size and resolution and make/model. It performs each action concurrently on identified devices with real data. It collects the performance metrics, bottlenecks, security vulnerabilities, and functionality checks. It provides general recommendations and tuning tips in the appropriate sections. Dashboard view provides you the execution table and API level chart as shown below. Monkop has three types of plans: Solo, Basic, and Pro. Solo plan allows testers/developers to test the app in randomly selected device with 10 executions per month. Solo plan has low priority queue by means you do not know when your apk will be picked up and tested. I uploaded one sample apk file by 08.06 PM, I got the results by 08.43 PM. It took around 27 minute to get the results. 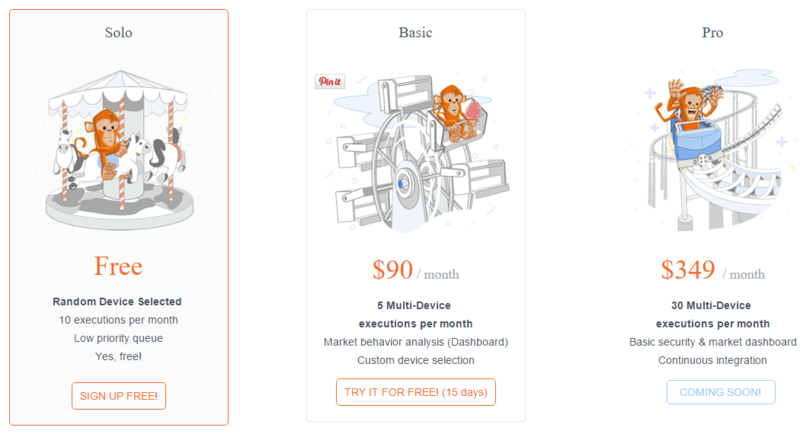 Basic plan costs you $90 per month where you can test your app up to 5 devices with 5 executions per month which is very low. In Solo and Basic plan, you will not get basic security check and continuous integration. Queue will have medium priority in Basic plan. Pro plan costs you $349 per month which allows you to perform tests across 30 multiple devices with 30 executions per month. It also comes up high priority queue plus CI and basic security and market dashboard which is coming soon plan. If your need doesn’t fit in above plans, you can contact sales team for the enterprise solution. Check the comparison chart over here. Overall Monkop is a great tool for testers and developers where in one test we can cover the performance, security, and functionality. If it supports Apple, Microsoft, and Blackberry apps, it will create an impact over other industry standard mobile testing solutions. Currently Monkop is in beta feature. Monkop is evolving very fast! Right now we release a CLI version that enable to use it in a CI enviroment.